Assistant Professor in the Department of Mass Communications, Dr. Mark A. Poepsel, introduced a brand new course this spring at Southern Illinois University Edwardsville. 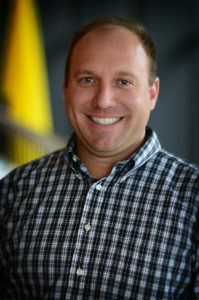 His course, BIOWIRE (MC471), has one primary objective—to teach students about communicating science to mass audiences and better prepare them for work in related professional communication fields. Dr. Poepsel plans to work in conjunction with numerous organizations like the Natural Corn to Ethanol Research Center (NCERC) with the course serving in part as part of their media production. “My college experience was to learn by doing, and that is what I want to provide to some extent for the students of SIUE,” Poepsel said. While there are many target objectives for the course, one of critical importance is to work on rebuilding the journalism model. “We are our own news outlet, but we will also push our stories to local small newspapers and news websites. It is vital to report information on our local sustainable producers in a way that helps news organizations in the region who no longer have the staff to do these types of stories. By the time students take this course, they will have all of the proper training to produce content and promote it to other media outlets” (Poepsel). What should you expect to see from this course? Currently, a website is under development by Dr. Poepsel’s undergraduate student, Avery Anderson. The course will garner connections with local producers and provide a behind the scenes element. Anderson along with other students in the class will be responsible for generating and uploading stories, taking photos and shooting videos, as well as maintaining a social media presence. “I seek to cover the industry foremost in the context of relationships with SIUE and let people know what we at the university are doing and how they can get involved whether they necessarily have a degree from here or not. The bioeconomy is where the job opportunities are and how we can truly start to make more politically informed decisions. If I can connect science to policy and prepare students for good jobs and tell people in the community where those production jobs are probably going to be, I think I will have done a good job.” BIOWIRE is supported through the summer of 2019 and will be available as a summer course to enroll in beginning March 25.